Teach Another Language to Kids (T.A.L.K.) Davis CA: Teach Another Language to Kids (T.A.L.K.) Davis CA...: Teach Another Language to Kids (T.A.L.K.) Davis CA: Intermediate Spanish, Birch Lane : Hola padres! 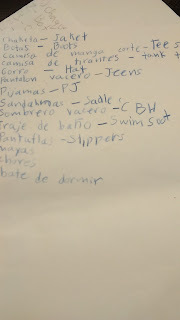 I wanted to show you a little bit of what your children have being learning in my Intermediate Spanish Class. Sorry about the late blog, but I just activated my account and figure out how to post my blogs. This past week 01/11-14/2016 we learned about formal and casual wear, and places where you could wear this kind of clothing. 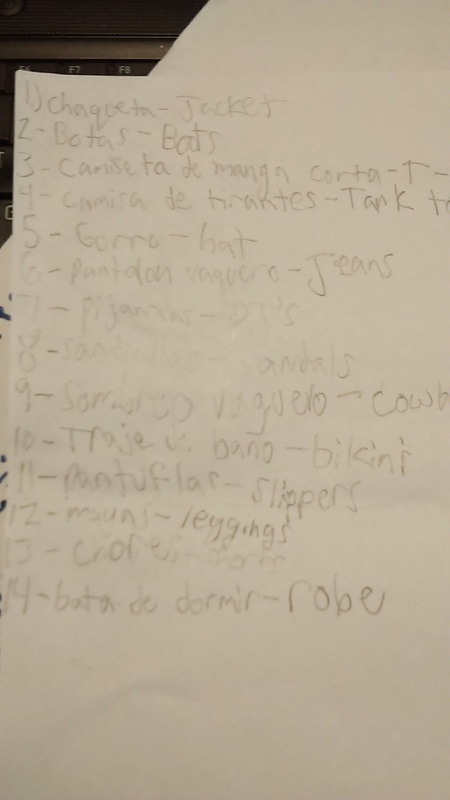 Formal wear; students saw the words in Spanish and they have to either guess or say what that word means in English, if they did not knew the word, I would give them clues until they figure out, if they were still not sure, I told them what that word was in English. Students had to also write the words in a white piece of paper both in Spanish and English, so they can both hear, see, write and learn the words.